As some of you might know, I’ve been designing and knitting a pair of mittens each month this year. To date, they have all been mittens stranded or intarsia colorwork. This month I decided to give myself a break and do something a little easier, stripes. I wanted to use the colors that reminded me of a sunset, yellows, oranges, pink and purples and I wanted them to blend together somehow. What I came up with was to use two strands of yarn at a time, sometimes of the same color and sometimes of two colors. This made for a nice quick knit, because the gauge was bigger, and gave an interesting effect. This looks best when the colors you choose are close together in tone. I’m really happy with my choices of oranges and pink, but wish I have found a pinkier purple. Note: Throughout this project you will be knitting with two strands of yarn, sometimes two of the same color and sometimes one each of two different colors. When knitting with the same color, I knit from both the outside and inside of the ball. Other than the initial row of yellow and final stripe of purple, each color stripe is 12 rows long. Cast on 46 stitches with two strands of yellow. Divide between three needles. Join together to knit in the round. Place a stitch marker between the first and last stitch to mark rows. Row 2: Switch to two strands of light orange. K until end of row. Row 14: Switch to one strand of light orange and one strand of orange. K1, p1 until end of row. Rows 15 – 19: k1, p1 until end of row. Cut the yarn leaving about a 6-inch tail. Put the tail onto a tapestry needle and eave into stitches remaining on the needles. Pull through to the inside and tighten. Weave in ends. Put the 17 stitches on the scrap yarn on three needles. 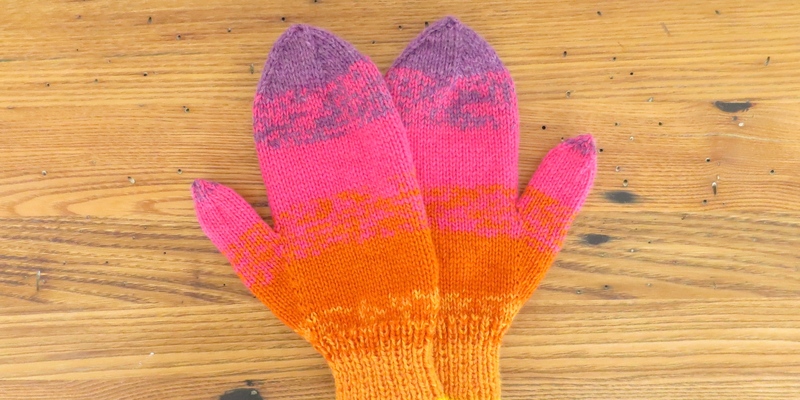 Pick up and knit 1 stitch from the hand of the mitten using one strand of pink and one of orange. Place a stitch marker after this stitch to mark rows. I like the purple. Great job! These are gorgeous! Love the colors. I knew you would be a fan of this color palette, Dr. Russ! 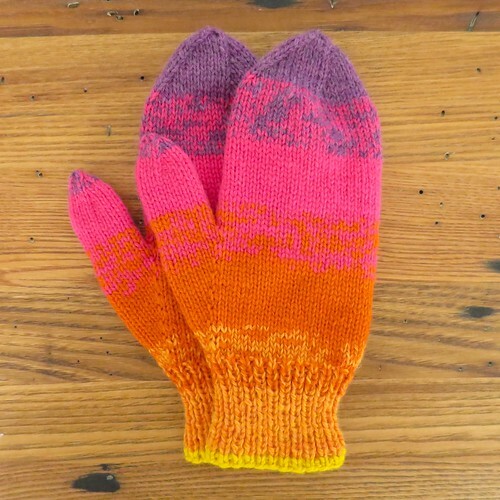 I agree, I does have the tropical sunset feel to it…even if it is on mittens! Looks like a summer sunset! For the thumb gusset increases should the M1l and M1r be reversed. Start with the M1R a right leaning increase then knit, then do the M1l for the left leaning increase? You can actually work it either way. I was just looking at Ann Budd’s Knitter’s Handy Book of Patterns and she does thumbs with the M1L first and the M1R second and that is probably how I did these mittens. Now though, when I knit mittens with a gusset I do it the other way. Work them whichever way you like.